It was Friday morning, December 17th, and the harbor was a mess. The damage has been estimated at about three million dollars by today’s standards. Law enforcement was unsure what to do next. Critics were writing condemnations of the previous night’s event, while supporters were writing songs about it. Two hundred and thirty six years later, we are still talking about it. Say what you will about the Sons of Liberty, they threw one memorable party. So memorable that modern political protests ranging from anti-war to anti-big government have evoked the name Tea Party for their own events. But while everyone knows something about the Boston Tea Party of 1773, there are a lot of fascinating things most people don’t know. We often hear of the “Mohawk Indian” disguises worn by the participants, but we never hear why they were dressed so. The event itself was largely organized by members of the Masonic order, who were very deliberate about the symbols they chose. The Native American was a symbol of complete Liberty, free to do anything and go anywhere. An Indian was born free and lived a life of natural freedom. Not everyone was disguised as a Mohawk at the event either. Some key organizers had made rough costumes and painted their faces, but the majority of the crowd smeared soot on their faces or anything else readily available. The costumes didn’t fool anyone; it was obvious that these were not real Indians attacking the tea ships. What the disguises were meant to do, and did well, was hide the identities of the participants. Today protestors usually show their faces openly, but (somewhat ironically) some dress up to look like Boston Colonists. The clothing of the 18th century has come to be a symbol of Liberty to us, just as the Indian was a symbol of Liberty to them. The protestors were not protesting high tax rates, as is often assumed today. In fact, the taxed tea was cheaper than the untaxed tea being smuggled into Boston. The protest was over England’s right to tax the Colonists at all. England had been trying to lay new taxes on the Colonies for some time, and the Colonists had been pointing out that England did not have the legal right to do so. The lawmakers in England had recently been forced to withdraw a large list of taxes because of the overwhelming opposition to them, but they left one tax (the tea tax) in place. The lawmakers believed if they made the tea inexpensive enough people would buy it and not even think about the tax. Once the Colonials had bought the taxed tea, English lawmakers could claim precedent. They could show that the Colonists had already accepted “taxation without representation.” The lawmakers were also trying to help out the British East India Company, which was losing money to smugglers. The Company was allowed to import the tea without paying the normal duties and so undercut the smugglers’ market price. You could look at it as a Government bailout of the East India Company, which the British Government deemed too big and too important to fail. 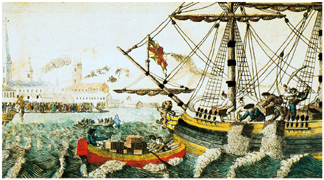 The £25,000 to £90,000 (reports vary) worth of tea that was thrown into the harbor that cold December night was shipped in crates that were covered with canvas. This is something that the paintings never get right, probably because the earliest image I can find of the tea party was created more than ten years after the event by someone who wasn’t there. The tea was loose leaf tea (in spite of what you may have heard in some east coast museums), and a great deal of it was green tea, which was more expensive and very popular in the era. 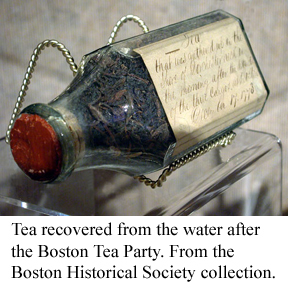 Although the famous Boston Tavern Song mentions England’s “vile Bohea” tea, it was not the primary type of tea carried by the Tea Party ships. Bohea was very popular, though, and by 1773 the word had become interchangeable with the word “tea,” much as we use Kleenex for any facial tissue today. Many people are surprised to learn that George Washington was not a supporter of the Tea Party. While he supported the ideals behind the Tea Party, he was appalled at the destruction of private property. The destruction of the tea came close to anarchy in his mind. This aspect of the event even worried the participants. When it was discovered that the lock broken on one ship belonged to that ship’s Captain, a replacement lock was sent to him. After the destruction of the tea some of the protestors even swept the docks clean. The protestors wanted to make it clear that the only thing they were targeting was the tea. 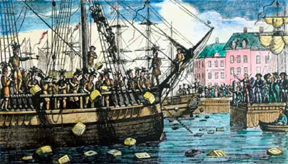 When Benjamin Franklin stated that the cost of the destroyed tea had to be repaid, a group of merchants offered to do so; the British Government refused to accept. There were spinoff parties even back then. There are stories of citizens in other places dumping their tea or signing pacts to stop drinking tea and boycotting its purchase. Perhaps one of the most interesting events took place in Annapolis, Maryland on October 19, 1774. The owners of the ship Peggy Stewart had tried to smuggle in some tea claiming it was linen, but then decided to come clean about what they were carrying. The Tea Boycott Committee allowed everything else to be unloaded from the Peggy Stewart, but as word got out a mob developed. Eventually the ship’s owners were forced to burn the ship themselves to avoid further trouble. 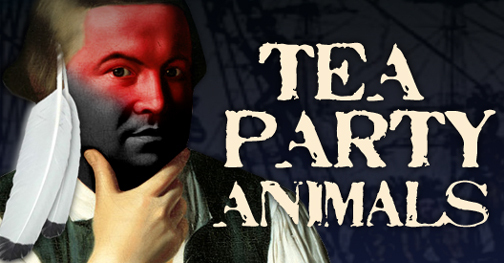 People rarely talk about the consequences of the Boston Tea Party. Nancy Pelosi denounced the party as a “manufactured protest” and “Astroturf, not grassroots” (oh wait…that was the 2009 Tax Day Tea Party). 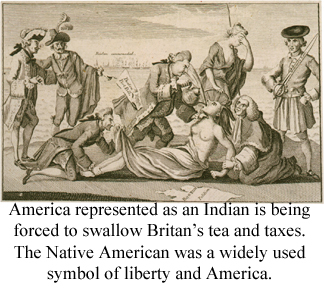 Seriously, the Boston Tea Party led to the Intolerable Acts being made law by the British Parliament. These Acts included the closing of Boston Harbor, which cut off all business and the livelihood of all Bostonians, whether they had participated in the Tea Party or not. The Massachusetts Government Act said that the Royal Governor or the King would appoint almost all positions in government, no longer allowing citizens to elect their leaders. The Administration of Justice Act allowed the governor to move trials of accused royal officials to another colony, or even to Great Britain, which ignored long established trial by jury laws. The Quartering Act demanded that the colonists quarter (house) British troops that were being sent to control them. These laws convinced many previously loyal Colonists that England was, in fact, willingly crushing their rights. In the end, what had started as a protest against government abuse of power ended up escalating that abuse and pushing all the colonies closer to Revolution.